Step 1 In the bowl of a stand mixer using a paddle attachment, or in a medium bowl using a hand mixer, mix together the butter, 1 cup of the sugar and the salt until combined, 1 to 2 minutes, being careful not to overmix. With the mixer running, gradually add the flour and mix just until the dough comes together. Step 2 Divide the dough into quarters. Shape one quarter into a small log, about 2 inches in diameter, and cover with plastic wrap. Combine the remaining quarters and shape into a disc. Wrap the disc in plastic wrap and refrigerate both portions for 1 hour until firm. Step 3Heat the oven to 350 degrees. Unwrap the disc of dough and press it into a buttered, 9-inch-square metal cake pan, working the dough until it evenly covers the bottom of the pan. Prick the dough all over with a fork and set aside. Step 4Unwrap the small log of dough and roll it into a rough (6-by-8-inch) rectangle (this does not need to be perfect -- the dough when baked will be crumbled as topping for the bars). Place the dough on an unbuttered baking pan. Step 5Place the cake pan on the top rack of the oven and place the baking pan on the center rack. Bake the baking pan shortbread until lightly browned along the edges, about 15 to 20 minutes, and the cake pan shortbread until golden brown, 30 to 35 minutes. Transfer each pan when done to a cooling rack to cool completely. Run a knife along the edges of the cake pan to loosen the shortbread as it cools. Step 6When the shortbread is cooled, spread the honey evenly over the cake pan shortbread. Crumble the smaller shortbread and sprinkle 1 cup of the crumbs over the honey (save the rest for sprinkling over ice cream). Lightly press the topping into the shortbread. Cut the shortbread into 5 rows in both directions to make 25 squares. 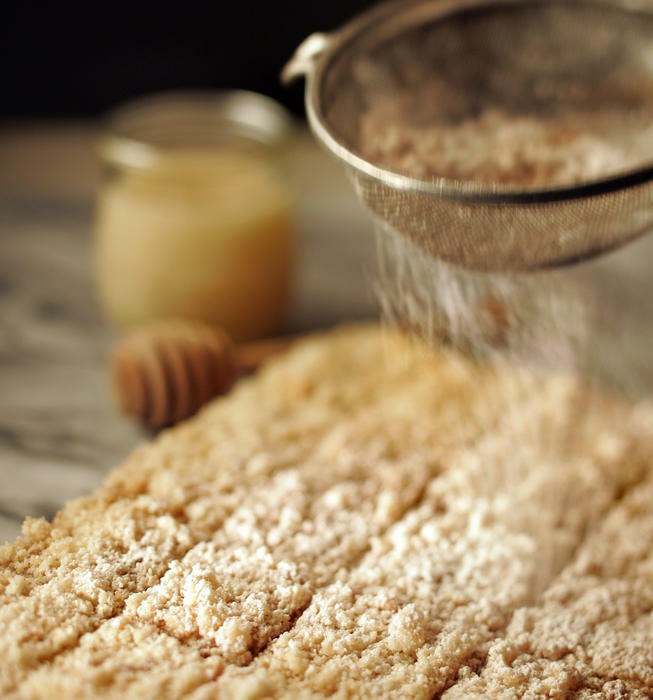 Combine the remaining powdered sugar with the cinnamon and sift over the shortbread before serving. In Recipes-list.com we have selected the most viewed recipes from category - Desserts . Enjoy the best recipes specially selected for you! Wildflower honey shortbread bars is the right choice that will satisfy all your claims.